Scientists and engineers are gathering in California's Silicon Valley next week to discuss the research potential of suborbital spaceflight, and one of them will win a free ride in a space plane just for showing up. The 2012 Next-Generation Suborbital Researchers Conference (NSRC-2012) will take place from Monday to Wednesday (Feb. 27 to 29) at the Crowne Plaza Hotel and Resort in Palo Alto. Just before the meeting begins, one lucky attendee will be chosen at random to receive a free trip to suborbital space aboard XCOR Aerospace's Lynx vehicle. 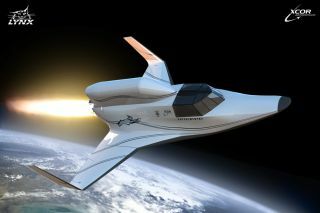 XCOR officials have said the rocket-powered Lynx could be in flight-test operations by the end of 2012. The company plans to charge $95,000 per seat when the space plane is up and running. NSRC-2012 brings scientists and educators together to talk about how commercial suborbital spacecraft can help advance research in atmospheric science, physics, planetary science, biology and physiology, among other fields, according to conference organizers. "NSRC-2012 will also provide the user community for these vehicles a key opportunity to make inputs on vehicle design and operational requirements," organizers wrote on the conference's website, adding that strategies to maximize public outreach and education will be discussed as well. The meeting will include more than 100 oral presentations, as well as several keynote addresses and a series of panel discussions. Notable speakers include XCOR president Jeff Greason and George Nield, associate administrator for commercial space transportation at the Federal Aviation Administration. Former NASA astronaut Neil Armstrong will also give a talk, but it apparently won't be about becoming the first person to set foot on the moon during NASA's Apollo 11 mission back in 1969. Rather, Armstrong is slated to talk about the early days of suborbital flight and his experiences aboard the experimental X-15 aircraft, according to the NSRC-2012 program. The conference is jointly hosted by NASA, the Commercial Spaceflight Federation, and the Colorado-based Southwest Research Institute.